Sometimes you just happen upon a pub while passing by and think to yourself I better have a look in here. On this occasion the pub was The Mill, in the village of Shottermill, literally a few yards past the Welcome To West Sussex sign. An attractive looking pub from the roadside, I pulled into the car park. There were a couple of vehicles parked up but couldn’t much sign of life in the pub, so quickly checking on my handy Good Beer Guide App, It told me opening time was 11.30, excellent it was now 11.45. I headed to the side door only to find it locked, undeterred I sauntered around to the front door admiring the pub sign along the way. Ah a Wadworth pub then, I tried the front door fearing the worst, but success, it opened, I walked into the front room, no one in sight, however the ownership of the pub was confirmed. There were several area’s to the pub so I wandered through to the rear room which was more of a dining area, it was there I encountered human life, “are you open” I enquired, ” not really” was the reply from the landlady, “we open at 12.00” She served me anyway, I explained my information was obviously wrong on opening times, citing my app and What Pub, “what’s that” she said, after further explaining she told me,”well our web site is correct, it was indeed, I have sent the correction to What Pub so hopefully their’s will be too in the near future. I took my pint of Wadworth Horizon back to the front room to take in my surroundings. It was a traditional low beamed pub with a mix of seating, high and low, four beers on, three from Wadworth as you would expect, and dog friendly going by the bowl on the floor, that’s unless I had the pub totally wrong and that was a spittoon on the floor. The restaurant area to the rear is actually a large extension, not visible from the road and so not spoiling the look of the pub from the front, Its quite tastefully decorated and doesn’t detract to much from the much older traditional front two bars in the original pub. 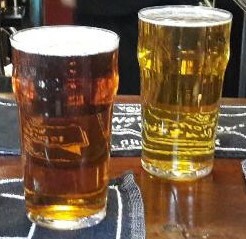 I am not the greatest fan of Wadworth beers but my pint was very good and made my brief visit well worth it. As I was leaving a dog brought it’s owner in for a pint, It wasn’t a spittoon on the floor after all. That must be new to the Beer Guide, I must be due a visit. I won’t turn up at 11.30. That 11.30 time must come from the pub originally, mustnt it ? I don’t think it is currently in GBG, I don’t have the latest copy, the app covers all pubs in or out. What Pub states it is a former GBG pub. I have sent the correct opening times to What Pub but are not changed yet, I reckon the times date back to before Wadworth took over the pub in 2015, probably slackness on the local CAMRA branch’s part.